Once home to the nation's largest plutonium-making facility, Hanford, Washington, is now one of the most toxic nuclear-waste sites in the world. The U.S. Department of Energy (DOE) is currently spending $2 billion a year to clean up the 586-square-mile reservation. However, not all is well on Washington's dusty southeastern edge: Whistle-blowers are stepping forward, claiming that taxpayer money is being spent recklessly on a project riddled with potentially deadly design defects. Donna Busche, who has been employed by contractor URS (originally known as United Research Services) as acting Manager of Environmental and Nuclear Safety at Hanford's Waste Treatment Plant (WTP) since 2009, is among the latest of these senior managers to speak out about what she sees as the silencing of those who raise concerns about possibly lethal safety issues. Last November, Busche filed a complaint of discrimination under the federal whistle-blower protection statutes with the U.S. Department of Labor, alleging retaliation against her for reporting problems at the WTP, which one day will turn Hanford's 56 million gallons of highly hazardous radioactive waste into storable glass rods through a process known as vitrification. Climbing the corporate ladder in the male-dominated engineering world was no easy feat. But Busche, as numerous co-workers say, is tough, politically savvy, and scientifically skilled. After attending graduate school at Texas A&M and before arriving at Hanford, Busche was the Chief Nuclear Engineer and Manager of Nuclear Safety at the DOE's Waste Isolation Pilot Plant in Carlsbad, New Mexico. Busche's job at Hanford is to ensure that the site's contractors produce adequate documentation to support the contractor's compliance with federal environmental and nuclear-safety laws, meaning that virtually no aspect of construction can take place at the WTP until Busche says it is safe to do so. “I'm where the nuclear-safety buck stops,” says Busche. If Busche says “Stop,” the work must stop. But saying “Stop” to the wrong guys, Busche claims, has gotten her in a heap of trouble with Hanford higher-ups. Among her grievances, Busche claims that she has been sexually harassed by URS manager Bill Gay. In Busche's official complaint, she explains that Gay made inappropriate and sexist comments to her in an unscheduled meeting, “including comments that women react emotionally while men use logical thinking.” Gay also allegedly told Busche that, as an attractive woman, she should use her “feminine wiles” to better communicate with her male cohorts. Gay apparently also said that if Busche were single, “he would pursue a romantic relationship with her.” Busche notified Human Resources shortly after Gay made these remarks, at which point he reportedly apologized. Gay would not comment on the allegation. Perhaps even more damaging are Busche's claims that, beginning in 2010, the lead contractor at Hanford, Bechtel National Inc., shirked safety compliance, signing off on shoddy work in order to meet deadlines that would earn the contractor large financial incentives. For example, radioactive-waste stirrers called pulse jet mixers have had numerous design problems, such as erosion and potential leaking. Despite these concerns, Bechtel pushed through testing saying they were sound. Their timing was impeccable: It was late June 2010, and by having their plans finalized by the end of the month, the company would receive a $5 million bonus for reaching cost and schedule goals. Busche says that during this time she was viewed as a roadblock to meeting these goals. As a result, Busche's concerns were suppressed and Bechtel managers allegedly sought ways to retaliate against her. When Busche showed up for a second day of hearings, she claims she was approached by Frank Russo, who runs the WTP project for Bechtel; Bill Gay; and Leo Sain, a senior URS vice president. They all urged her to recant her earlier testimony when she met with the DNFSB. She replied that she would not. She is currently awaiting a response from the Department of Labor about her complaint. Busche's story — when coupled with that of the DOE's Dr. Don Alexander, as outlined in Seattle Weekly last fall (“The Nuclear Option,” October 19) — provides ample evidence that management at both Bechtel and the DOE are at best ignoring, and at worst actively retaliating against, experts with inconvenient opinions. And because it's nuclear waste that's being dealt with, their alleged negligence could ultimately prove deadly. The government's manufacturing of plutonium to fuel the atom bomb was a scientific feat unlike any that came before it. At the nucleus of this gargantuan undertaking was Hanford. The roaring Columbia River provided the much-needed water to help keep its reactors consistently cool, and Hanford's remoteness allowed the facility to operate with scant international attention. Today Hanford no longer produces plutonium for nuclear weapons. Instead, the scientific and engineering minds employed there are tasked with an equally, if not more, daunting endeavor: cleaning up one of the largest radioactive nuclear-waste sites in North America. The DOE manages the Hanford project for the federal government, but contractors such as Bechtel and URS act as the design and contract specialists for the site's most important undertaking, the construction of the WTP. Once the glass rods roll out of the WTP, which will be a first-of-its-kind operation, they are to be stored in a safe place where a radioactive leak is far less likely than it is today — Hanford's waste currently remains in old, underground tanks that are decades past their lifespan. While Bechtel holds the primary contract with the DOE to build the WTP, URS acts as their subcontractor, and the companies split all fees 50/50. URS also holds another contract for managing Hanford's Tank Farms, where the 56 million gallons of radioactive waste are held. Over the duration of the WTP contract, from 2001 to today, Bechtel has raised their proposed budget from $4.3 billion to $12.263 billion, with more increases likely to come: In late August the DOE's Construction Project Review team estimated an extra $800 to $900 million would likely be needed to finish the job. Watchdog groups, like the Seattle-based Hanford Challenge, say the final cost could top $20 billion. Either Bechtel drastically underestimated the cost to build the WTP, or they blatantly misled DOE when they said they could complete the project for $4.3 billion. This is not the first time Bechtel has increased a government contract and failed to deliver: In March 2006, the Special Inspector General for Iraq Reconstruction (SIGIR), an oversight group set up by Congress to keep an eye on government contracts in Iraq, found that Bechtel was mismanaging a hospital project that was way over budget. In mid-October 2004, Bechtel scored the contract to build an Iraqi children's cancer hospital for $50 million, promising to complete the construction by late December 2005. However, SIGIR's report found that Bechtel likely wouldn't finish work on the hospital until at least July 2007, with a final price tag of $169.5 million. After SIGIR's report on Bechtel's gross mismanagement, the government canceled the company's contract for the hospital. Another contractor later completed the hospital construction in 2010. This incident wasn't unique: A 2007 SIGIR report found that fewer than half of Bechtel's projects had met their original objectives. Additionally, the majority of Bechtel's Iraq projects were canceled, reduced in scope, or never completed at all. Now a number of engineers and scientists, like Don Alexander, are wondering why Bechtel isn't coming under the same kind of congressional scrutiny for its even larger contract to build the WTP. A high-ranking DOE scientist at Hanford, Alexander first spoke out in this publication to express his concerns with managerial and operational aspects of his work at the WTP, as well as the plant specifications that had been carelessly accepted as safe and sound. In one instance, Alexander pointed out the DOE's and Bechtel's refusal to re-evaluate their so-called pulse jet mixer design, which is supposed to keep the radioactive waste at the WTP constantly moving, after his own studies showed that the containers that held the mixers would erode, potentially causing a lethal radioactive leak. Alexander says that following the article, the DOE is now paying close attention to the issue, and has assigned one expert from the Massachusetts Institute of Technology, nine full-time staffers, and 11 Bechtel employees to resolve these design problems. But new evidence has emerged in a lawsuit, filed last May in Washington state court by Dr. Walter Tamosaitis of URS, that implicates high-level DOE employees in the silencing of Tamosaitis, who was removed from his management position at the WTP after he raised concerns about the plant's faulty design. In a deposition taken in this lawsuit in July, Bechtel's Frank Russo verified the names of DOE officials with whom he had discussed Tamosaitis: Dale Knutson, federal project director for the DOE at Hanford; DOE Deputy Secretary Daniel Poneman; and Inés Triay, who served as Assistant Secretary for Environmental Management under Secretary of Energy Stephen Chu until July 2011. Triay and Poneman were Obama appointees. In the deposition, Tamosaitis' lawyer, Jack Sheridan, asked Russo whether or not he had, via e-mail, told his boss, Bechtel President David Walker, that Triay, Poneman, and Knutson all “understood the reason for Walt's departure” and that “DOE can't be seen as involved.” Russo confirmed this, admitting to telling Walker that he had briefed Triay and Poneman on the issue. In early November 2011, Tamosaitis filed a second lawsuit against Bechtel and the DOE in federal court. Among other things, Tamosaitis' suit alleges that Bechtel management and DOE brass were concerned that the issues Tamosaitis was raising could put an additional $50 million of WTP funding in jeopardy. The DOE has filed a motion to delay certain evidentiary aspects of Tamosaitis' case from being allowed in future court proceedings. On Monday, February 20, the DOE asked the court to dismiss the suit. The court trial is tentatively set for June 2013, nearly three years after Tamosaitis' termination by Bechtel from the WTP. Additionally, in early December, Tamosaitis testified in front of the U.S. Senate's Homeland Security and Governmental Affairs Subcommittee. At the hearing, he explained how he was removed from his job and forced to work in an offsite windowless basement office as a warning of sorts to others who were contemplating speaking out. The panel is currently considering legislation that would extend whistle-blower protections to employees of government contractors. The DOE says they do not comment on issues related to pending litigation, such as that levied by Tamosaitis. But now, for the first time, two veteran Hanford scientists are adding their experiences to this unfolding saga by blowing the whistle on what they see as blatant corruption and mismanagement at Hanford's WTP. With these endeavors, the new whistle-blowers claim, DOE management is not only complicit, but taking direct actions to hide glaring technical problems from the public — problems that could lead to a catastrophic nuclear accident. At 78, longtime Hanford nuclear chemical process engineer David Bruce says his enthusiasm to do his job right is as great as ever. Many of his co-workers past and present see Bruce, who has worked for various Hanford contractors for more than 46 years, as a mentor of sorts — a man whose words are worth heeding. Last December, Bruce decided he'd had enough. He was aware of glaring technical flaws, such as problems in the mixing design that could lead to lethal leaks at the WTP and prevent it from ever running properly. These problems had not yet been addressed, and in a meeting with top management, including Russo, Bruce stood up and made his points. “After that meeting, [Frank] Russo came up to me and asked to meet with me later to discuss the issues that I raised,” Bruce says. He was a bit surprised; it was the first time anyone that high up in Bechtel management had seemed concerned with the issues he was raising. While he thought the meeting went well and felt that Russo heard him out, he still has very serious doubts about whether necessary changes will ever be made. Getting Russo to acknowledge even this much had proven an arduous slog. In late September 2009, frustration with their supervisors' failure to address ineffective designs had grown so high that Bruce and URS Senior Advisory Engineer Murray Thorson, both devout Christians, retreated to their work cafeteria to pray together. Their request to their Lord was simple: They asked Him, if their perceptions were correct, to expose what they saw as waste and corruption within the DOE and contractor management. During the previous six months, the two had worked diligently to come up with a design to eliminate precipitation in the ion-exchange system at the WTP. Buildup of precipitation in the feed to the ion-exchange columns, integral parts of the process of turning nuclear waste into glass, would cause the columns to plug or fail to function, jeopardizing the operability of the entire WTP facility. Starting in 2007, Bruce and Thorson had reached out to management with their concerns. But after being repeatedly ignored, they met with the DOE to outline the serious technical flaws in Bechtel's proposed design. Only then did Bechtel agree to do something about it. An ad hoc group was then formed, with Bruce and Thorson on one team and another set of engineers from Bechtel and URS on another. The two pursued a fix for the buildup of precipitation, which became known as the Equipment Option, while the other group developed an alternative Operating Solution. The Equipment Option was projected to take five fewer years to process Hanford's nuclear waste into glass. At an operating cost of roughly $1 billion per year, that's a $5 billion savings for taxpayers. The Operating Solution, on the other hand, might temporarily fix the issue, but would provide less reliability and less flexibility and increase the amount of time needed to process the nuclear waste. More important to Bechtel, however: The Operating Solution would have cost less in construction dollars to implement. Bechtel took both options to the DOE, stating their recommendation of the Operating Solution option. DOE, however, ended up opting for Thorson and Bruce's design. Tamosaitis, then serving as URS management advisor for the precipitation study teams, says, “Murray [Thorson] and Dave [Bruce] had the undisputed answer to the problem. Everyone knew it, but despite this fact, Bechtel management did not want to accrue the costs of the fix. So they picked the cheaper, less adequate solution. ”Bechtel knew darn well DOE would [not pick the Operating Solution], and would go with the Equipment Option,“ Tamosaitis continues. ”But they pursued this approach anyway, so that DOE would ultimately cover the cost“ — because, according to their contract, if the DOE picks a more expensive solution to a problem, they, rather than Bechtel, have to cover the costs by adding funds to Bechtel's [baseline] budget. Thorson's other accomplishments at the WTP are well-documented. From 2002 to 2008 he led a highly successful effort that resulted in changing the type of resin used in the WTP's ion-exchange columns. This resin acts as a sponge to separate radioactive cesium from the waste, helping to decontaminate Hanford's radioactive material before it is processed into glass. Bechtel was not supportive of Thorson's efforts, however, because more than $11 million worth of research and testing was required to develop and qualify the resin, despite its potential long-term savings of billions of dollars. Another resin already existed, and despite all its problems and associated high cost, Bechtel contended it was acceptable, and told Thorson to stop the development effort. All indications were that the original resin was not going to work — it gummed up, potentially plugging and causing the system to fail. Even so, URS and Bechtel management disagreed with staff recommendations and claimed the resin was fine as it was. The DOE thought otherwise, and the agency's federal director at the time, John Eschenberg, authorized the group Thorson was working in to move ahead with the new resin development, agreeing to cover the research costs, which were added to Bechtel's WTP budget. After several years of research and testing, Thorson's efforts paid off, and his resin was demonstrated to be a tremendous success. The new resin was substantially less expensive than the original resin. When all is said and done, Thorson's resin will save taxpayers at least $3 billion. Shortly after the DOE chose Thorson and Bruce's Equipment Option, Thorson wanted out. He did not feel his work was being adequately appreciated at the WTP, though he'd saved the project billions of dollars. When an opening arose at Hanford's Tank Farm, which handles the underground storage containers that hold the toxic site's remaining nuclear waste, Thorson went after it, even though it carried a lesser title. Thorson's new job was to work on an oversight group called CLIN 3.2, responsible for looking at long-term operability issues at the WTP. Though technically still a URS employee, Thorson would be working for a company called Washington River Protection Solutions (WRPS), which led CLIN 3.2's evaluations. WRPS is a joint company accountable under their contract to URS. CLIN 3.2 stands for Contract Line Item Number 3.2, which was included in Hanford's Tank Farm contract between the DOE and URS, the company put in charge of Tank Farm operations. The Tank Farm contract is separate from the WTP contract. 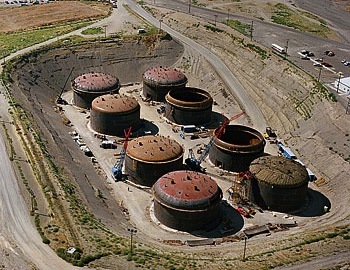 Bechtel is not involved in the Tank Farm contract, but URS acts as its lead contractor, responsible for safely retrieving, treating, storing, and disposing of Hanford's Tank Farm waste, which currently sits in 177 underground concrete tanks that are grouped into 18 ”farms.“ The Tank Farm contract is worth $7.1 billion. Waste from the Tank Farms will one day move to the WTP through piping and different treatment facilities. The final phase of this process will turn this processed waste into glass. So the Tank Farm and the WTP are to work in conjunction to ensure optimum success. In the Tank Farm contract, CLIN 3.2 called for the establishment of biannual independent evaluations to ensure the WTP would run properly. ”This isn't your typical project design,“ says Thorson, referring to areas in the WTP called black cells that hold piping and equipment. Once sealed, these cells will be off-limits to maintenance. If something like erosion causes a radioactive leak in these vessels, nothing can be done. One of the primary tasks assigned to the CLIN 3.2 evaluation group was to ensure everything inside these black cells would function as designed. Two sources, who worked as managers and engineers at Hanford and are familiar with the contract, say that CLIN 3.2 was a ”top objective“ of the Tank Farm contract, which would help ensure that Bechtel was kept honest since they would have a stake in both the Tank Farm and the WTP contracts. The first CLIN 3.2 report was issued in September 2010 and found numerous risks, including problems with reliability, operability, maintainability and throughput, hydrogen-vent control, precipitation of solids that could plug equipment, control-system documentation, and contamination control. After the report was issued, Bechtel said they would not answer design questions or support any reviews, asserts Thorson. ”Since DOE did not require them to do so — which Bechtel argued was not required by their contract — it really knocked the wind out of us.“ Though the reviews would benefit the WTP's potential success, Bechtel claimed they had no money to do reviews unless the DOE handed over more funds. Essentially, CLIN 3.2 was an elite technical review board without any real teeth. WRPS soon reduced CLIN 3.2 from a 12-person operation to half that. Even with the significant downsize, Thorson and others continued to work to put together an annual report — the ”Annual Waste Treatment and Immobilization Plant (WTP) Operational Support Report (For Fiscal Year 2011),“ released last September. Once again, the evaluation found serious vulnerabilities with the WTP that would likely require design changes and testing to remedy. The results of the report were briefed to the DOE. At that point, however, the report's classification was revised, then reissued as ”business sensitive“ and for ”official use only,“ rather than being released publicly as intended. ”The stated reason from the DOE at the meeting was to keep it out of the hands of potential critical reviewers such as the [DNFSB],“ says Thorson. Seattle Weekly has obtained a copy of the September report. It is the same as the version now classified as ”official use only,“ a DOE source notes. The report's authors identify numerous vulnerabilities, including the potential for hydrogen buildup due to faulty venting that could lead to a shutdown of the WTP — or worse, an explosion. Despite such potential calamities, at the end of 2011 the DOE verbally requested in a meeting that all CLIN 3.2 evaluations of the WTP in the form of annual reports be stopped for the indefinite future. Thorson says that he and others were also instructed by management to halt work on CLIN 3.2. Additionally, a draft alteration to WRPS's contract with the DOE has been circulated outlining this change in CLIN 3.2's work scope. No immediate justification was given by the DOE, but Meyer states that the DOE is now going to implement a ”one-system integrated approach“ that does not eliminate the CLIN 3.2 analysis, but rather combines work and safety reviews of the Tank Farm with those taking place at the WTP. The plan, marked ”Business Sensitive and Proprietary,“ reads in part ”An important feature of our proposed approach is acceleration of the transition“ of activities ”from the WTP line item to operating expense.“ The goal, the 2020 Vision notes, is to ensure that the WTP cost is capped at $12.263 billion. With this, the 2020 Vision lays out a plan for Bechtel to stay within their proposed budget. What this means is that the WTP will be shifting some of their research work to the Tank Farms, says a URS employee who wishes to stay anonymous for fear of retribution. Unlike Bechtel's WTP contract, the URS Tank Farm contract is not nearly as strapped for cash. By moving some work to the Tank Farm contract, Bechtel and the DOE can publicly contend that they have kept their WTP costs lower than they actually are. Giving the appearance that the WTP budget is not growing provides cover for the project, protecting against interrogation from outside watchdog groups and organizations like the Government Accountability Office and DNFSB, says Tamosaitis. ”[Bechtel] management here turns over every three years, and guys like me stay around to see the damage they've caused,“ claims an engineer who has worked for Bechtel for well over a decade and wishes to remain anonymous for fear of being fired for speaking out. ”The Bechtel mantra is 'Build Something, Be Paid, Be Gone,' “ adds Tamosaitis. Turnover at Bechtel typically occurs within management. For example, Bechtel has changed out project presidents on four separate occasions since they took over the WTP contract in 2000, most recently installing Russo as director just over two years ago. The anonymous Bechtel engineer says this is a clear sign that they don't have the project under control, and the DOE's Alexander admits his agency does not have enough technical staff to oversee the WTP project. Joshua Frank is an author, award-winning journalist, and managing editor of CounterPunch magazine.